We recently made the decision to move our online ordering platform to Amazon.com. This will provide you with lower shipping costs (in some cases FREE) and fresh gourmet coffee quickly delivered right to your doorstep! Enjoy and feel free to connect with us and share your feedback! The 2nd group of coffees (Coming Soon) are listed at the bottom of the screen! If you have a favorite, feel free to send us a message and let us know! Click the black Available on amazon icon to see our entire coffee menu on Amazon. As you connect with its inviting aroma and smooth, full-bodied flavor, you will feel invigorated, as you enjoy the best in coffee satisfaction! Whether you are preparing to charge the hill of success or unwind at the end of the day, any time is a good time for The Good Java! FREE Shipping with orders of 3 bags or more! The Good Java Company’s choice to stay completely organic stems from our desire to promote products that support health. Did you know that many decaffeinated coffees use a process that incorporates either methylene chloride or ethyl acetate as the decaffeination solvent? Yuck! This coffee is perfect for those times when you want to enjoy a warm, soothing cup of happiness without the caffeine. It’s all good, at The Good Java Company. 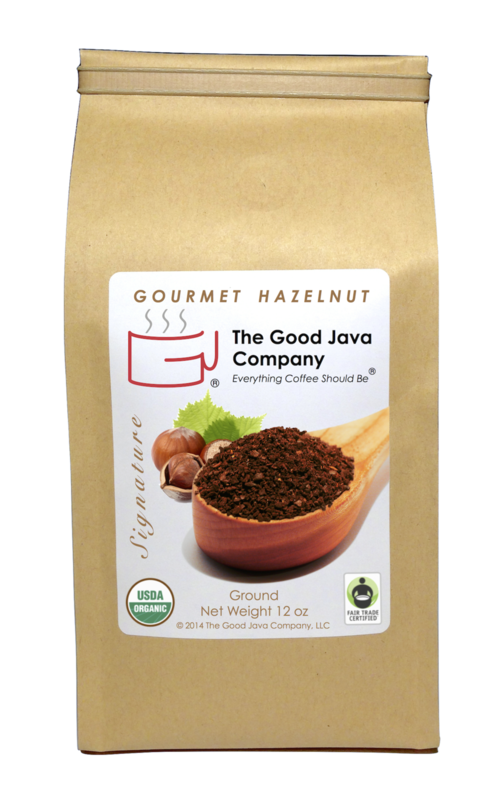 As you connect with the inviting aroma and smooth, full-bodied flavor of our Gourmet Hazelnut, you will feel invigorated, while you enjoy the best in coffee satisfaction! Whether you are preparing to charge the hill of success or unwind at the end of the day, any time is a good time for The Good Java!